Carolina Hurricanes fans are going to love Scott Darling. In fact, the recently acquired goaltender is already winning the fanbase over with his affable, easy-going personality and his charming sense of humour. Just look at his latest Twitter interactions for proof. When Hurricanes forward Derek Ryan tweeted out news of his contract signing yesterday, Darling took the opportunity to inquire about the availability of Ryan’s #33 jersey, the number Darling had worn during his time with the Chicago Blackhawks. Ooh… that’s a steep price to pay, Mr. Darling. No word yet on whether or not there are any future considerations or conditional picks included in the swap. 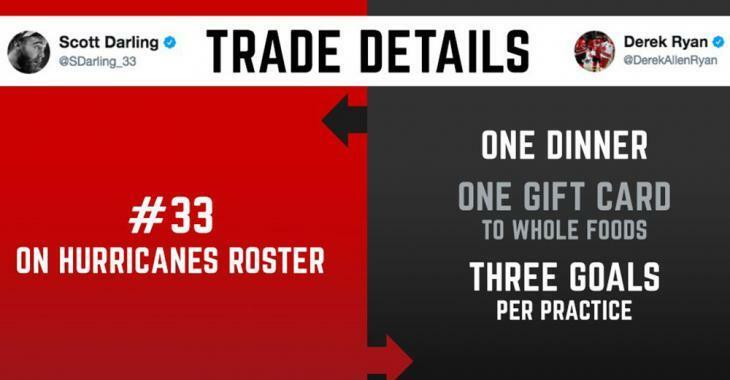 We’re going to need the entire TSN or NBC panel to break down this blockbuster deal for us!